Cheers to the passing of 2018! Another chapter is written in our “Book of Parrot Head Tales.” Exciting stories include monthly phlockings, St. Patty’s Day Celebration, Disc Golf Tournament, Land and Sea clean ups, and Island and Beach parties. Then there’s wild accountings of a daring Diva Walk, a hot chili cookoff, the building of a hippie bus, and an Island Santa Bar Crawl. But the best 2018 stories were those of many helping hands, strong working heroes, outstanding sacrifices, major giving and encouraging support for those affected by Flo! Yes folks, this has been one “well” of a year, full of wonder and mystery, calamity and joy. We have all written these stories together! Santa Crawl is Saturday, December 8th, Read all about it! 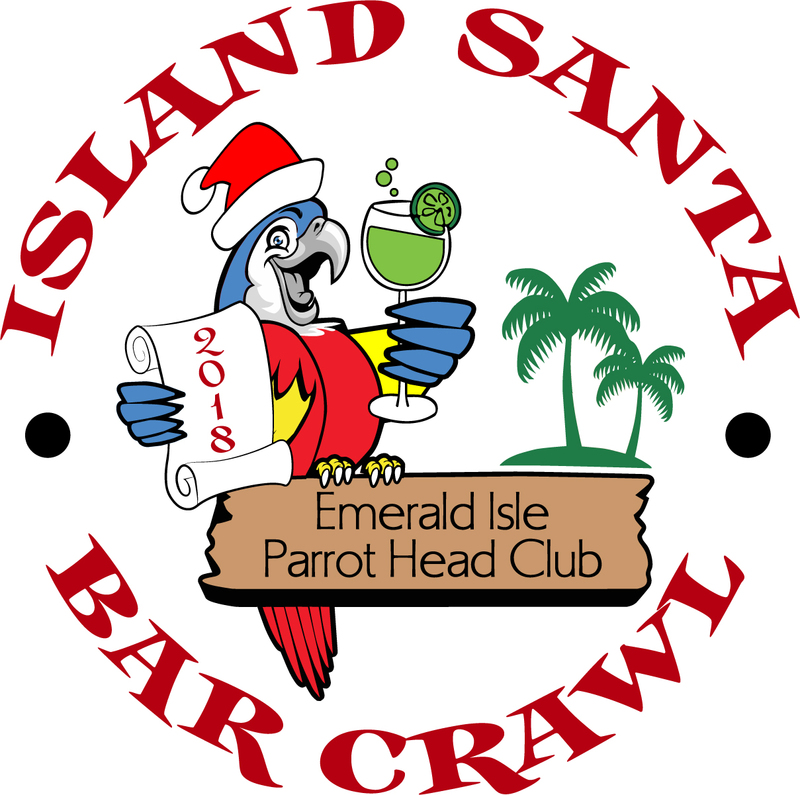 December 8th– ISLAND SANTA BAR CRAWL 2:00-6:00pm to benefit Make a Wish -. This fun event is sponsored by the Emerald Isle Parrot Heads to benefit the Eastern Carolina Make a Wish Foundation. $10 for pre-registration, $15 the day of the event. Pre-registration at www.emeraldisleparrotheads.com or on Facebook – Emerald Isle Parrot Heads. On line registration ENDS on Thursday, December 6th. You can also pre register at the December 7th First Friday PHlocking. On the day of the event, Saturday, the Emerald Club will be open at Noon for participants who have “registered online” AND for “live registration.” Registration will end at 1:30. We have had a great outpouring from local businesses that have sponsored this event, so please let them know you appreciate their help. This event is hosted by the Emerald Club. Where – The Crawl starts and ends at the E-Club and you can crawl, walk, ride a bike or ride with a DD or other safe transportation (Please do not drink and drive) to 7 local “watering” holes. (The Growler, The Island Time Tavern, Sharks Den, Trading Post, Salt, Snapperez and Surf’s Up.) Stops will have drink specials so be prepared. The bars/stops open at 2 and close at 6 p.m. sharp! There will be a 50/50 Raffle too! What- Dress for the season, Santa, Elves, and Ugly Sweaters welcome. There will be a $50 prize for best dressed. There will be a food truck at the E-Club at the end of the event. Check out Urban Street Eats from Cedar Point on Facebook. Options : PhotoScavenger Hunt with $200 winning prize. Get a team of PHriends (pick a team name); Teams can be 2 or more people (remember if you win you have to split the $200 cash prize) . Pick a Captain who will be the one in charge and who must have a digital camera/phone. All photos need to be on one device to be eligible to win. All stops must be visited to compete. Visit each stop at your own pace and in your own order and perform the required photo selfie at each bar/stop exactly as listed on the Scavenger Hunt Entry Form, using one designated phone for pictures. Your entire team must return to the Emerald Club and give your completed playing card to the volunteers at the door entry no later than 6:15 to qualify for the drawing. At the end of the game, a team will be drawn from the completed cards. If your team is drawn, you will be asked to show, from the designated phone, pictures of each completed task before being presented the $200 as winner. Make a Wish Foundation – Our local branch is working hard to make wishes come true for critically ill children in our area. When a wish comes true it helps children feel stronger, more energetic, more willing and able to battle their critical illnesses. For many, the wish marks a turning point in the fight against their illnesses. Doctors, nurses and other health professionals say the wish experience works in concert with medicine to make their patients feel better emotionally and even physically. That is why wishes matter. That is why we want to help Make a Wish grant wishes.